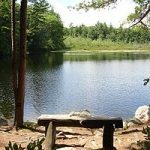 New Hampshire’s Bear Brook State Park includes over 10,000 acres of heavily forested land interspersed with marshes, bogs, ponds, and summit views. To reach these and other attractions, the park contains forty miles of trails for hiking, mountain biking, snowmobiling, cross-country skiing, and more. One can find a secluded place for picnic or reserve a spot in the over 100-site campground for a longer stay. Bear Brook State Park is located in the southeast region of New Hampshire with its entrance on Rt. 28 and minutes from both I-93 and I-95, the park is just west of Portsmouth and the seashore or east of Concord and Manchester. The park provides almost anything for the outdoor enthusiast or family with young children. Built by the Civilian Conservation Corps (CCC) during the depression, Bear Brook State Park remains in use as originally designed. Within the park, mostly housed in historic buildings, is a museum complex that includes the New Hampshire Antique Snowmobile Museum, the Richard Diehl CCC Museum, natural displays, and more. A “shelter” located near the day-use area and adjacent to a ball field, barbecue pits, and horseshoe area is available, by reservation, for special occasions such as family reunions, office outings, or even a wedding. Fires are limited to designated areas. Pets, if leashed, are welcome in the campground and on trails but not in the day-use area. Most attractions are accessible to all but some trails might present a challenge to the handicapped. Starting from the toll both and parking in the day-use area or a few smaller parking areas within the park, one can find the trail or recreation area to match their interests whether they include hiking, fishing, boating, biking, bird watching, fall foliage, or snowmobiling. There are 26 trails to choose from and the descriptions below are just a selection. • One-Mile Trail is an easy trail that serves as the main artery to the more popular and challenging trails such as Bear Brook Trail and Catamount Trail. • Bear Brook Trail, the Bear Brook State Park namesake trail, follows Bear Brook and provides a well-shaded path that remains relatively cool even in summer, perhaps more so, with the background sound of running water and the sight of an occasional brook trout. It is a beautiful trail of moderate difficulty and leads to Archery Pond. • Archery Pond provides river trout for only fly-fishing enthusiasts. For the family, a special pond is just across the path for children under twelve with no restrictions. A somewhat unusual but popular attraction is the archery ranges nearby the pond. • Catamount Trail leading to Catamount peak provides, just before the peak, the hiker with perhaps the best open lookout in the park. The peak itself is an open outcrop of granite but is not above the tree line and the view can be obscured in summer but is a beautiful spot to enjoy the fall colors. Catamount is a steep trail and can be quite rocky at times depending on spring thaws and freezing movement. Located in the Catamount Pond parking lot is a workout trail with twenty different workout stations for a fun way to exercise in the woods. Catamount Pond has a beach and canoes or boats are available for rental. • Bobcat Trail is an excellent trail for hiking, biking, and cross-country skiing. The trail passes through a stand of red pine begun as a tree plantation during the 1930’s by the CCC. The trail is narrow and of moderate difficulty. • Lane Trail is great path that follows an old timber road. It is wide and has a smooth walking surface ideal for large groups. Traveling through two meadows and into a lowland forest near the Bear Brook parking area, this is a fun hike but has a few steep sections. • Hall Mountain Trail is a wide trail providing access to the highest peak in the park at the top of Hall Mountain. The peak is an open, shrubby area interspersed with exposed granite outcrops. Primarily used by snowmobilers in the winter, it is a moderate to difficult excursion. • Bear Brook State Park Campground is on Beaver Pond, five miles from the day-use area, and open for reservations from Memorial Day weekend through Columbus Day. Beaver Pond has a beach and the pond is great for a canoe or kayaks.